Interest in gorilla trekking has grown significantly in recent years and is expected to get an even bigger boost thanks to the visit this year by the well-known TV talk show host, Ellen DeGeneres. Although numbers are steadily increasing due to conservation efforts, there are only just over 1,000 mountain gorillas left in the wild and it’s a real thrill to meet them face to face. Diane and Anouk have had the opportunity to track gorillas in Uganda and Rwanda respectively, and they both agree it was an utterly unforgettable experience and one of the top 5 of their safari experiences. Where Can You Track Mountain Gorillas? 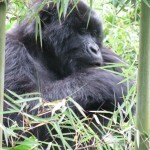 We offer gorilla tracking in in either Uganda or Rwanda. There are currently 12 habituated gorilla groups in Bwindi Impenetrable National Park in Uganda, with 11 available for tracking by tourists and one reserved for research purposes. These gorilla groups include Mubare, Habinyanja, Rushegura, Oruzogo, Bitukura, Kyaguriro (research group), Nshongi, Bweza, Mishaya, Busingye, Kahungye and Nkuringo groups. There is only one habituated gorilla family in Mgahinga National Park-called the Nyakagezi group. Bwindi Impenetrable National Park protects about 62% of all the critically endangered mountain gorillas that live in the Virunga complex, making it one of the leading destinations for gorilla trekking in Africa. 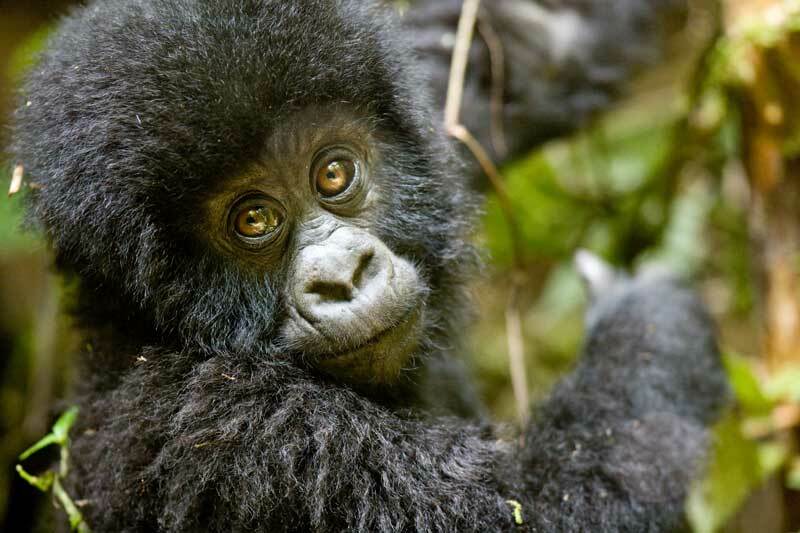 Volcanoes National Park in Rwanda is home to 10 habituated gorilla families including the Susa gorilla group, Karisimbi gorilla group, Sabyinyo gorilla family, Amahoro gorilla family, Umubano gorilla group, the 13 group (Agasha family), Hirwa gorilla family, Bwenge gorilla family and Ugenda gorilla family. In Rwanda, permits cost $1,500 per person. With a maximum of eight people in a group, this means that only 80 permits are issued per day. 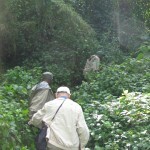 In Uganda, permits cost $600 per person, per trek, with most of the proceeds going towards further conservation efforts. Permits are also limited to eight people per visit so because of this, you need to book your safari at least six months in advance. Rwanda has the reputation of offering slightly less strenuous hikes to some of the gorilla groups (even so, it’s not an easy hike and it’s worth getting fit before you go). The PNV is also just a three-hour drive from the capital Kigali, and so more convenient as an add-on to a safari in northern Tanzania, or even Kenya. Uganda’s gorilla parks are a long day (or overnight) drive from the capital Kampala and you tend to have to hike longer to find the gorilla groups. However, Uganda does offer traditional safaris in other parks, plus an amazing chimp-trekking program in Kibale. 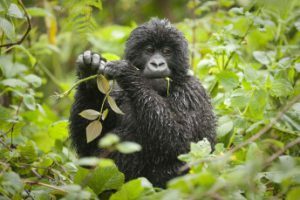 The very good safari circuit includes forest walks, and birdwatching expeditions as well as other attractions in the Bwindi region, including experiences with the indigenous Batwa people and even rafting on the Nile. The introduction of a ‘seat on plane’ flight from Entebbe to Bwindi has made the park more easily accessible, particularly for travelers not interested in an extended safari in Uganda. If gorilla tracking is the entire focus of your trip to East Africa, then it is very easy to combine tracking in Rwanda and Uganda. The driving distance between the parks in both countries is very doable. In fact, we highly recommend that you track gorillas twice if you can. A second time allows you to truly enjoy the experience without concerning yourself with cameras and videos. The mountain gorillas that are left have survived by living on incredibly steep volcanic slopes, in nasty, dense, stinging vegetation. It’s a lovely bamboo/nettle/celery salad bowl for them, but very painful for those of us without thick fur. Some gorilla families are just a couple of hours away from the parking area, others can be a stiff four to six-hour hike in. Trackers scout the nesting areas of each gorilla family before the trek starts, so they have a good idea where you need to hike to. This means you will certainly find the gorillas, but the time it takes to get to them always varies. Porters and guides are on hand to show you the path, hack through the vegetation and carry your stuff if need be. Walking sticks are provided as well. Because the terrain is steep, muddy and difficult, the pace is always slow and steady. You do have to be fit and your knees should be in reasonable shape, especially for the hike down. Those with asthma should bring inhalers as it’s also very humid. When you get to the gorilla group you will have to give up your walking sticks and rely on your hands to climb up and down the slopes and keep yourself from slipping. Thin sport gloves offer excellent protection against nettles, but make sure you can operate your camera with them on. Wear long pants made of slightly thick material to stop the nettles from burning your skin, and thick, long socks you can tuck into your pants. In some areas, there are fire ants that like to climb up your legs and you don’t want to be stomping around when you are surrounded by gorillas. A waterproof jacket is necessary to keep warm and dry as it rains a lot and the vegetation is often wet with dew in the morning. Wear layers with long sleeves since the higher elevations are chilly and the thick foliage rarely lets the sun shine through. Make sure your walking shoes are comfortable and worn in so you don’t suffer from blisters. Your lodge will usually offer to clean and dry your shoes after your trek. You are allowed to spend an hour with the gorillas, and should always follow your guide and trackers’ instructions. They will remind you to stay at least seven meters away from the gorillas. If they come closer to you, you will be told to stand still, or crouch down. The guides know these families and each individual, so you don’t have to be scared. No one has been harmed by a habituated gorilla. It is very likely that they will get close enough that you can smell them, which is a thrill to say the least. Sometimes the gorillas will make a lot of noise and small spats can break out, while others may be playing, eating or just grooming. You will likely be moving around a little to keep them in view since they don’t always stay in one spot. Often the younger gorillas will be playing all around you and hanging off the bamboo above you. Watch out ­– bamboo is not strong and gorillas seem to enjoy riding the stalks down, so it’s a little unpredictable. Try and spend some time just watching and not always filming or taking photos. It’s tempting, but you do miss out on just being there, and your precious time will be over before you know it. Note that if you’re sick – even with just a common cold – you can’t track the gorillas as they’re highly susceptible to human disease. At this present time, you’ll only be required to show proof of yellow fever vaccination if you’re traveling from a country with risk of yellow fever, or a country with an active yellow fever outbreak, but always check well in advance. Visas for entry to Uganda are US $100 and can be obtained on arrival, payable in US$ cash, or in advance online at https://visas.immigration.go.ug/. *Please note entry regulations can and do change frequently so please contact us for the latest information. For an inspirational, insider’s view of the conservation issues impacting the mountain gorillas, listen to legendary conservationist and safari operator, Praveen Moman’s TedX talk: Save Gorillas: Focus on Communities. Ready to Book Your Gorilla Adventure? We can help you organize your gorilla safari in both Uganda and Rwanda. You need to book a gorilla safari at least six months in advance because permits are limited and they sell out quickly. Contact us for more information.